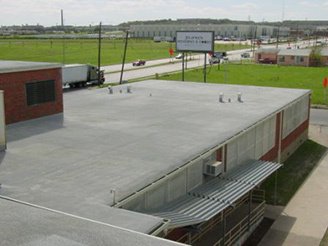 One of the best ice dam solutions available for commercial buildings is a well-insulated roof — but most owners and managers of commercial buildings in the Dallas-Fort Worth area don’t think about ice dam prevention until it’s too late. It’s not too hard to figure out why: We just get ice and snow around here less often than in other areas. The DFW area is a strange place, weather-wise. In a single year, we can go from temperatures over 100 degrees and severe drought to flooding to golf-ball-sized hail to snow and ice storms. Throw in a few tornados (and even some earthquakes) and your commercial building has to work pretty hard just to keep standing year after year. 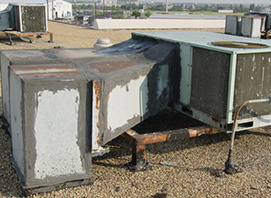 If the roof of your commercial building has a leak, you have a problem — a major one. 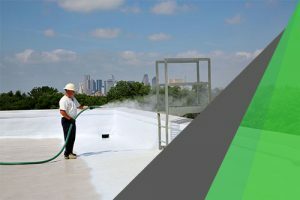 In Texas, roofs have a unique environment to contend with, and normal wear and tear, combined with heavy, damaging UV rays, a wide range of hot and cold temperatures (which create off-the-charts expansion and contraction), violent thunderstorms, and even ice and snow, can result in a shorter lifespan for your roof. And as your roof deteriorates, leaks can form. Today, the average commercial roof lasts 5 to 7 years, give or take a few years. The lifespan of your roof varies quite a bit depending on how well the roof has been maintained and the materials used to build it. In fall 2012, DFW Urethane was brought in by a hotel construction specialist on the renovation of an older hotel in a Gulf Coast-area entertainment district. The multi-story, 200-room luxury hotel had sustained exterior and interior storm damage earlier in the year, and needed to be ready to welcome guests by mid-January. The hotel construction specialist overseeing the restoration had previously worked with us on several projects and was impressed with the quality of our work. He asked John Ewell to evaluate the hotel’s modified bitumen roof, which he suspected needed replacing. He also showed John some of the older windows with air-seal issues, and noted the need to block out noise. Provide a high R-Value and reduce energy consumption – significantly lowering utility bills. Add structural support – important in weathering storms with wind speeds of 100 mph and higher. Minimize the transmission of sound – keeping guestrooms quieter. Prevent potential water seepage through brick walls. This solution was exactly what the client needed – and it supported their commitment to reducing the hotel’s carbon footprint. With the proper equipment, product mix expertise and seasoned installers, it was a fast process. DFW Urethane synchronized seamlessly floor-by-floor with many other contractors. The spray polyurethane foam insulation filled and sealed all the spaces around windows, spots where the stucco was cracked and wherever there were gaps or air leaks. As soon as the first two floors had been insulated and weatherized, the hotel became less drafty and much quieter. The indoor air quality also improved, and the chiller-based HVAC units no longer run as much to maintain the proper temperature. The renovated hotel is now quieter, more comfortable and more energy-efficient with its new high-performance, environmentally friendly weatherization package. Energy consumption and utility costs are being tracked, with annual savings projected at 21-33 percent. And, the renovation was completed right on time, enabling the hotel to welcome its guests in comfort and style. Today, all aspects of building are becoming more energy-wise. The lighting industry actively promotes changing to LED and CFL light bulbs. More efficient HVAC systems deliver greater energy savings with higher SEER ratings. And new energy-efficient windows reduce radiant heat and leakage of conditioned air. All of those strategies are great for residential buildings, but don’t make a meaningful difference in a commercial setting. For example, new bulbs can only trim energy costs by 1 or 2 percent. What’s the top way to cut energy use by a commercial or industrial building? Look up. The roof is the place to make the biggest, most ecofriendly impact. 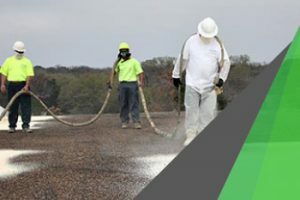 Specifically, reroofing with a durable, watertight spray polyurethane foam roofing system instead of removing and replacing the roof with conventional materials. Many of our customers come to us for help with old buildings, because they have problems with leaks or they get too hot or too cold. While some of those commercial buildings go back to the 1940s to 1960s, we also do a lot of work on older buildings. We’ve been involved in many projects that are bringing historic downtown areas back to life. Old stores, courthouses, theaters and warehouses are being repurposed into restaurants, lofts, new stores and more, transforming the original center of communities across North Texas. DFW Urethane’s spray foam roofing and insulation have supported these makeovers that preserve the charm and architectural details of a bygone era – but with modern comforts and more energy efficiency. See More “Green” With Energy-Efficient Roofing! 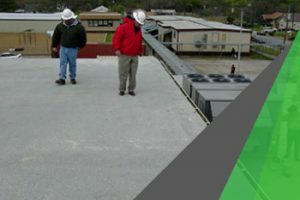 For years now, we’ve heard from customers who have discovered a byproduct of their spray polyurethane foam (SPF) roofs: shrinking utility bills. 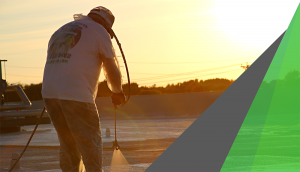 When they hired us to spray their roofs, they were just focused on eliminating the water leaks that put their building’s contents and occupants at risk. The subsequent energy savings have been an unexpected “green” bonus. Spray polyurethane foam (SPF) is the highest-performing material available today for commercial roofing and building insulation. 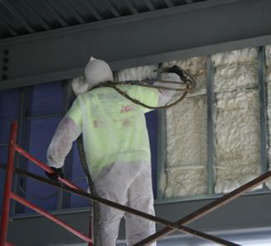 It consists of sprayed insulating foam that is applied as a liquid and expands to many times its original volume. 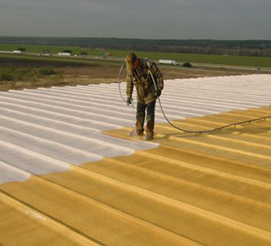 Because it is made of closed-cell polyurethane, the foam is impermeable by water or moisture. SPF insulation couples a high R-value and air infiltration control, fundamental to energy efficiency. By creating a super-tight air seal, it protects buildings and their occupants from moisture, extreme temperatures, noise and contaminants. Roofs That Just Can’t Leak! DFW Urethane works with a lot of customers whose building roofs simply cannot leak. A roof failure that causes water to pour in can ruin expensive equipment, raw materials or work in progress, putting people and operations at risk. If there are puddles inside every time it rains, you’ve got safety hazards and liability issues. Not to mention spiraling insurance premiums and deductibles triggered by sky-high roof replacements. In these situations, our seamless spray polyurethane foam roofing systems offer tremendous peace of mind.